Location: Pierrefiche, in the Aveyron departement of France (Midi-Pyrenees Region). 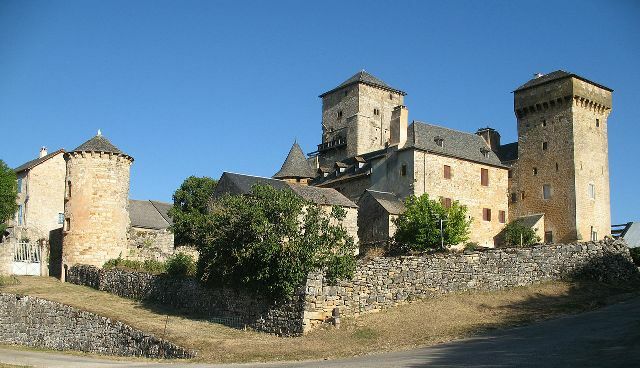 Notes: Château de Galinières is a walled barn situated in the municipality of Pierrefiche in Aveyron. It overlooks the meanders of the Serre valley. The construction of the tower, a square plan tower-loft, begins in 1371. The second floor is said chamber of the Abbot, which retain painted decoration referring vine shoots. In the backyard, the home of storage timber is set against the fortifications; we notice a door arch, a Gothic window and window seats at windows. The building that houses the fold is composed of arcs diaphragms. It belonged to the family Baldit. The threshing floor dates from the early seventeenth century. Fountains, houses for the farm staff complete the package. Galinières barn was the subject of several protections as historical monuments: the barn itself is the subject of a registration as a historic monument since February 13, 1928. The keep (facades and roofs) is the subject of a classification as historical monuments since February 26, 1988. The tower is open to visitors since 1992. Finally, the assembly including the former home of the storage timber, the old barn that was owned by the family Baldit and the threshing floor is the subject of a registration as a historic monument since May 26 1999.